Oh yes, I remember your call while I was on the road – I just got back from the doctors and I’m still at 0cm so don’t rush, if you get tired stop somewhere for the night. Thankfully the Lord gave me strength and I made it there with only a few hours to spare. I can hardly believe it has been a year already and Ashlyn is turning one tomorrow. Happy Birthday little one!! I can’t believe it’s been a year! Happy Birthday Ashlyn! Cute pictures of the girls! 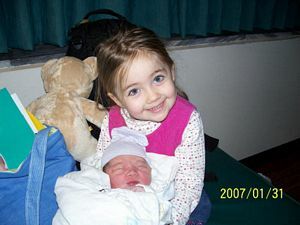 I love that Libbey & Ashlyn share a birthday–Jan. 31 was a good day to give birth. eh???? Happy 1st Birthday, Ashlyn! 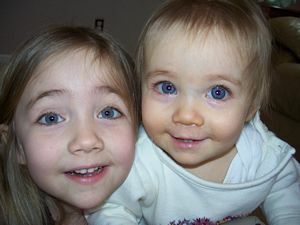 And I’m loving the pic of the girls together–they are TWINS!